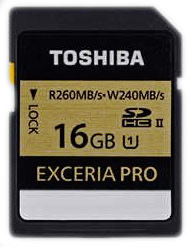 Toshiba announced two new SD cards, called Exceria and Exceria Pro (not exactly a name I'd associate with a card, but hey, all the good names are taken, right? ;~). The cards will be available starting in Japan in October. To my knowledge, there's no camera currently available that understands UHS-II or can write SD at the maximum speeds these cards are able to attain. Which leads me to the question: which camera is Toshiba expecting to use these cards? The press release does mention "bursts of photographs in quick succession" as well as 4K video in a parenthetical statement. Let's see…what cameras are coming that we expect would use SD cards and need burst speed? Bueller? Nikon has long played a role in new technology releases in cards. The most obvious examples of that were UDMA and XQD, where a Nikon camera was the first to implement in-camera support for the new technologies. But there have been other less obvious examples where Nikon has introduced a camera that's at the front edge of a new card technology. So when I see something that looks "next generation" announced like this, I look around to see whether it might be useful to Nikon in some way. Hmm. Which camera could that be that might need to write sustained bursts of images? Hmm. Which camera might Nikon announce in late August or early September and have available in October? Hmm.